OK, it has been very hot and muggy for most of this July. So you might think a 20 degree F drop in temperature would put smiles on our faces. Perhaps so if the cool temperatures were not accompanied by grey skies and drizzle. Regardless, we set out for a tourist day in and around the North Fork and had a terrific time. Here are the high points of the day. Try humming “Raindrops Keep Falling on My Head” while reading on. 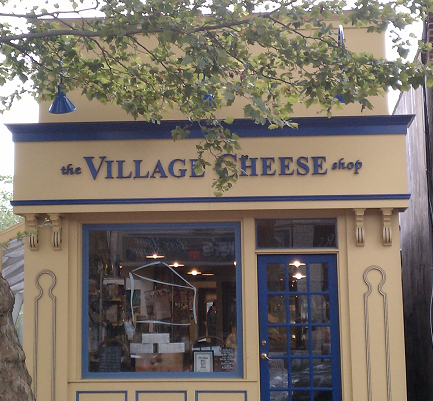 Lover’s Lane is one thing, but we were eager for lunch this trip, and headed for quaint Love Lane in Mattituck, home of The Village Cheese Shop. Not surprisingly the place sells great cheese, but it also has terrific sandwiches to take out. We chose a pair of French-style offerings, one with pate and brie, and the other with ham and Gruyere, both on baguette. Love Lane has many interesting businesses catering to the hungry visitor. These include a chocolate shop, a gourmet market, a wine tasting storefront, and the Love Lane Cafe. Need something to read with lunch? No problem. On the corner facing Rt. 25 you will find BookHampton. Love Lane is definitely worth a visit. Now ready with sandwiches, we move on to find our picnic spot. While the North Fork has many wonderful outdoor picnic sites, the cold and rain forced us to find the right indoor venue. We have long enjoyed Pellegrini Vineyards as a lunch picnic site. Today with the rain, the stone patio and wisteria-covered pergola were bare of tables and sunbrellas but the helpful and accommodating staff invited us to picnic inside. More than friendly, the tasting room staff is extremely knowledgeable about their wines. Today we tasted two Chardonnay wines, one steel-fermented and one barrel-fermented. The 2012 steel was clean, tight, and light. Yes, your guests would enjoy it as a sipper. The 2011 barrel-fermented was the better choice for our Love Lane sandwiches and some homemade salads we had prepared earlier. The salads were an eclectic mix of flavors that included tabbouleh, a Moroccan-style carrot salad, and an Italian-style pasta salad. A tough challenge for most wines, the 2011 did a great job. With a vanilla and pear nose, it was fairly priced at $18.99, both a food-friendly and people-friendly wine. When have finished your tasting or lunch, take some time to stroll around the winery grounds. 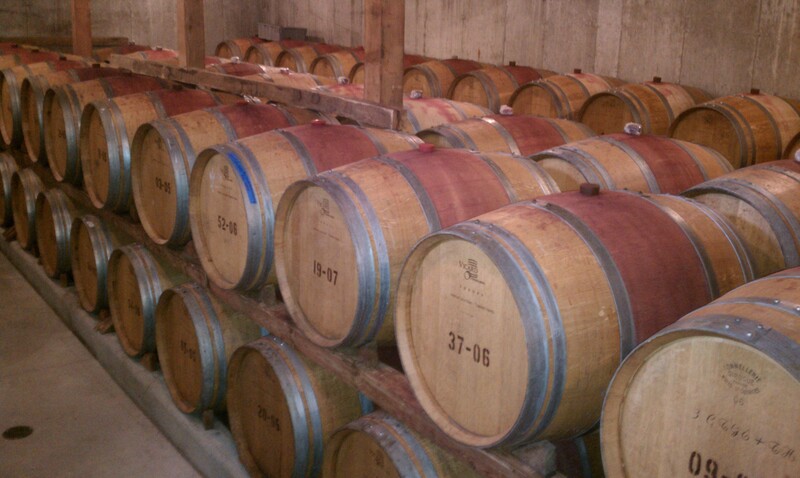 Visit the tank room and barrel room to see where all that good wine comes from. What happens after lunch? Dessert, of course, with some hot coffee. On to Junda’s. 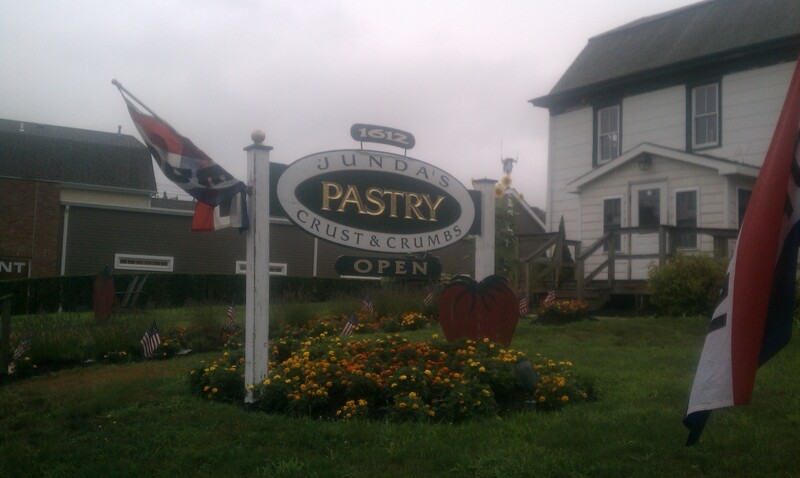 Junda’s Crust and Crumbs makes great pastry and great coffee. This European-style bakery makes rich but not overly-sweet treats. Cookies, strudels, pies, cakes, and Marian’s personal favorite, kruschiki (Polish bow-tie cookies). No, the treats are not calorie-free. Yes, they are delish and worth enjoying. Located on the Rt. 25 (the South road) in Jamesport, Junda’s makes a great first stop on entering the Long Island Wine Trail or a last stop before heading home. We take the latter approach, figuring that the sugar and caffeine will sustain us for the voyage back to East Hampton. Today we enjoyed a chocolate croissant with our coffee, and took home some of their famous apple strudel. Next time we will bring home some of Junda’s breads. That raisin pumpernickel called out to Stu, but he was “talked down” by the carb-conscious Marian. She was thinking of squeezing into her Lycra swim skin. Hey, dinner was great! Stu riffed on Melissa Clark’s recipe by substituting fresh Greek oregano for fresh rosemary. Why? Marian grew some beautiful oregano, and Stu has no great love for rosemary. Well, the garlicky Porchetta tasted great with oregano, and the Arneis picked up the anise notes present from the combination of fennel fronds and fennel seeds used to flavor the Porchetta. If you are not a big fan of anise, delete the fennel seeds from the recipe. Accompanying the Porchetta was a sweet and sour red cabbage (hey, we like red cabbage), roasted fennel, and some Basmati rice. Yes, a tough combo of flavors, but the Arneis worked. One other thing about this Arneis. It has frizzante, a mild carbonation that makes your tongue tingle, but does not produce visible bubbles like a Champagne. We love the frizzante sensation, and it keeps the wine feeling fresh on your palate throughout your meal. Despite the unseasonable and drizzly weather, we had a great day and did some great eating and wine touring. So, sunshine does come in bottles. Forget the weather and be a tourist in your own town.